British Columbia has been slammed with forest fires this summer, with more than 200 wildfires burning around B.C. in mid-July. For an update on the current wildfire situation, please go to Logging and Sawmilling Journal’s website at www.forestnet.com (Photo of helicopter working on a controlled burn at the Cisco Rd. forest fire near Lytton, B.C. courtesy of BC Wildfire Service). A coroner’s jury has ruled the explosion and fire at the Lakeland Mills sawmill in Prince George, B.C. in 2012 as accidental, and it made a number of recommendations to help prevent such a tragedy from occurring again. 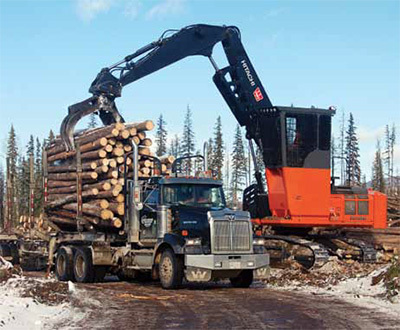 Long-time coastal logging contractor Ted Arkell of Dyer Logging has found the challenges of logging have changed over three decades in the business, with a need to be far more business-minded to make a return on your equipment investment these days. A significant investment in the small log line at Oregon’s Rough and Ready Lumber has resulted in better aligning production to the local log supply—and delivered solid economic benefits to a hard-hit part of the state, with the re-started sawmill. A long-established, family-owned B.C. trucking firm, Valley Pulp & Sawdust Carriers, has recently expanded into log hauling, and is finding their already established trucking base—and their focus on their customers—gives them an edge in this competitive business. Alberta logging contractor Ted Freake finds that when it comes to the people who run his equipment, it pays to take the time to train operators—sometimes from scratch—with the goal of building loyalty and long term employee relationships. Nate Burton, Technical & Safety Services Manager of the Association of Equipment Manufacturers, on the top five causes of forest equipment fires, and how operators can avoid them. The ongoing recovery has seen some contractors returning to the forest industry—New Brunswick’s Greg Davis and Wade Regan have now returned to the industry, and moved from a chainsaw/cable skidder operation to mechanical harvesting and a harvester/forwarder set-up, to better ensure their success. 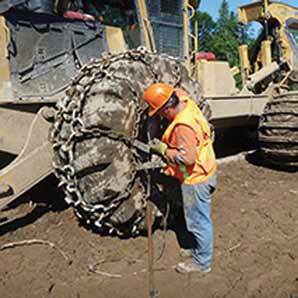 Planning for the largest live equipment logging show in North America next year—DEMO 2016, to be held at the UBC Research Forest near Vancouver—is well underway, with recent planning meetings firming up the details for DEMO. The Canada North Resources Expo, held in Prince George, B.C. at the end of May, was a huge success, thanks to features like a 30 per cent boost in outdoor exhibition space and the show hosting the first Northern B.C. Safety Conference. Included in this edition of The Edge, Canada’s leading publication on research in the forest industry, are stories from the Canadian Wood Fibre Centre, Alberta Innovates - Bio Solutions and FPInnovations. 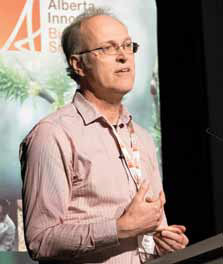 Given the changes that have occurred in the Canadian forest industry—and what’s to come—Tony Kryzanowski says it’s time for the Canadian forest industry to refresh its research and development priorities. 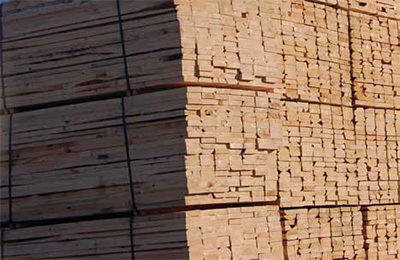 The collapse of the U.S. lumber market in 2006–2007 ultimately led, in 2010, to the Ulkatcho First Nations securing 100 per cent ownership in the West Chilcotin Forest Products (WCFP) sawmill. To help address the challenges of operating a sustainable sawmill in a remote area such as Anahim Lake, B.C., Chief Zach Parker engaged the services of FPInnovations to perform an opportunity assessment under the B.C./Alberta Aboriginal Forest Sector Technical Support Program. Dave McRae, who manages the program on behalf of FPInnovations, and program consultant Bill Lewis responded to the mill’s request. Their study supported the reopening of the mill, and the study made numerous recommendations on various aspects of WCFP’s operations. With the help of WCFP staff and other key industry players, Bill Lewis developed an analysis that proposed a new formula for a viable and sustainable operation. 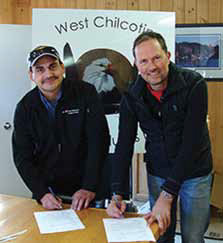 Chief Zach Parker, Ulkatcho First Nation (far left), and FPInnovations Vice President Peter Lister sign a Letter of Understanding. FPInnovations was also called upon to conduct two studies on the costs and benefits of wood waste-fuelled combined heat and power systems, to replace the diesel generators now in use. This work was completed in 2014 by FPInnovations Senior Researcher, Dr. Marian Marinescu. Chief Zach Parker of the Ulkatcho First Nation is quick to acknowledge the role that FPInnovations and the B.C./AlbertaAboriginal Forest Sector Technical Support Program have played in the resurgence of WCFP as a viable forest products manufacturer. “It is only thanks to FPInnovations that we are now confident the mill can operate continuously and successfully, and be a catalyst for a revived community. With the help of FPInnovations, we have come close to success; with your continued support, success is assured,” said Chief Zach Parker, of the Ulkatcho First Nation. Over the past year, FPInnovations’ Harvesting Operations group has continued to provide the forest industry with two services targeted at increasing the operational efficiency and financial performance of its logging contractors. Firstly, in partnership with 20 member companies, FPInnovations has provided business skills workshops to about 25 different logging contractors, including First Nations crews, involving over 100 participants. Additionally, over 60 member company employees participated in these workshops. The workshops consist of day-long sessions framed around the concept of continuous improvement and FPInnovations’ DiagFor tool. DiagFor is a diagnostic and benchmarking process that divides a contractor’s business into eight responsibilities. This interactive workshop engages participants and challenges them to look at how their operations deal with issues such as fuel management, machine productivity and utilization, machine maintenance and repair strategies, measuring financial performance, managing people, product quality, and complying with environmental obligations. While measuring the value of such a workshop is often difficult, post-event surveys have told FPInnovations that reducing machine idling time, controlling fuel consumption, getting a better handle on machine utilization, and understanding the break-even point of each phase of an operation are some of the “low-hanging fruits” that participants identified as immediate potential improvements to their operations. As well, many company representatives indicated that they found it very helpful when concepts and terminology that are often misunderstood are clarified. While getting logging contractors unaccustomed to a classroom environment to sit inside for half-a-day is always a challenge, FPInnovations often had to extend the duration of the workshop beyond the scheduled time because of high interest from the participants! FPInnovations presented its Robotics in the Forest Workshop April 21-23—a successful event that aimed at discussing promising avenues for advanced technologies in forest operations. For the first edition of the event, nearly 75 guest speakers and participants got together in downtown Montreal. The event—coordinated by Jean-François Gingras, Research Manager, Forest Operations at FPInnovations—attracted participants from the forest industry, equipment manufacturers, government agencies, universities, advanced technology providers and people in the research field. The attendees came from all over—from Canada, of course, but also from 12 other countries as far away as New Zealand, Brazil and South Africa. One of the purposes of the workshop was to present the forest sector representatives with the progress achieved by other sectors, and particularly by the university network and the mining sector, on the development and integration of automation and robotization technologies. The second objective was to identify the most promising technological solutions for responding to the challenges inherent in the lack of manpower in tomorrow’s forest sector as well as the profound changes in that “new” manpower of tomorrow. And lastly, the last objective was networking and making new contacts, potentially leading to partnerships or alliances. Based on the lively discussions following the presentations and those during the breaks, this objective seems to have been easily reached. Nearly 20 technical presentations were made, covering topics as varied as the technologies used in mines, robotics in manufacturing plants and in the field, aerospace, remote operations, self-learning systems, the automation of repetitive tasks and the new efficient sensors now available on the market, particularly those usable by drones in the air or on land. It seemed clear, following the various discussions, that some of these automation technologies will be integrated into forestry equipment on a large scale in the very near future. Following the workshop, the participants were given the opportunity to tour McGill University’s Centre for Intelligent Machines (CIM). At the invitation of CIM’s Director Greg Dudek, the various laboratories for artificial perception, applied dynamics, robotic mechanical systems, aerospace mechatronics and for the simulator produced by CM Labs opened their doors to the visitors, who were very interested in this display of new technologies. To develop its program for the Robotics in the Forest Workshop, FPInnovations benefited from the technical support of Unmanned Systems Canada, Université Laval, the Swedish University of Agricultural Sciences (SLU), FPAC, SkogForsk, McGill University and the Canadian Institute of Forestry as well as the financial support of Natural Resources Canada, through its Transformative Technologies Program for the forest sector. Several companies in the forestry sector also chose to express their interest in this new topic by serving as sponsors of this event: John Deere Inc., Tigercat Industries, Liebherr Inc. and Fibria Pulp. More information on the subjects presented during the workshop may be found at: http://fmtc.fpinnovations.ca/. Additional information may also be obtained by contacting Jean-François Gingras, Research Manager, Forest Operations, at 514-782-4543 or by e-mail at jean-françois.gingras@fpinnovations.ca. Environmental change is coming to Alberta, both on the positive and negative side of the equation, with this year’s dry spring and numerous forest fires an indicator of one major challenge the province’s forest industry could face in the not-too-distant future. Dr. Mike Flannigan spoke on potential future fire events in Alberta at the recent AI Bio Impact Innovation public outreach event. “Forest Fires in Alberta’s Forests: What Does the Future Look Like?” a presentation given by Dr. Mike Flannigan, Professor at the Department of Renewable Resources at the University of Alberta, was one of several presentations given at this year’s fifth annual Alberta Innovates Bio Solutions (AI Bio) Impact Innovation public outreach event, held recently in Edmonton. AI Bio funds research and knowledge transfer like the work being done by Dr. Flannigan to ensure that industry is well-prepared for potential imminent changes that could impact its future. “Fire is going to have the biggest impact on the Canadian forest,” Dr. Flannigan said, and Alberta will be no exception as annual mean temperatures rise due to climate change on a global scale. “We’re getting a lot warmer than we used to be,” he added. “You give me hot, dry and windy conditions, and we’ve got a fire problem.” While fire is a common occurrence in the boreal forest, with about two million hectares burned annually, “in the last two years, we have burned double that,” he said. Dr. Flannigan indicated that some models predict that the average mean temperature in Alberta could get five to six degrees warmer by the end of this century. “And the warmer it gets, the more fires you have.” He noted that Alberta has already adjusted its spring fire season from starting April 1st to starting March 1st. The province is unique compared to other areas of Canada because most fires occur in Alberta in May, and not in summer. Given what is known about climate change and when most forest fires occur in the province, as well as the fact that most fires are caused by humans and not lightning, “we can be better prepared for spring fires.” Better preparedness is the advice that he passed on to all Albertans in general, and to stakeholders such as government and the forest industry specifically. Other presenters spoke about making better use of our environmental resources to solve specific remediation issues or to produce new and environmentally friendly consumer products—an initiative strongly endorsed by AI Bio Board Chair, Art Froehlich. “If we are going to have sustainable and efficient production, we need novel products,” he told the outreach audience. That starts with gaining more knowledge of what is in our forests and food to help us address future environmental and food production challenges, he added. Among those new products is cellulose nanocrystals (CNC), a minute component that can be extracted economically from wood fibre and can strengthen, enhance or alter the attributes of consumer, commercial, or industrial products. With help from Alberta Innovates, Alberta has spent $6.7 million to build a CNC demonstration plant capable of producing 100 kilograms of CNC per week. In his presentation entitled, “Cellulose Nanocrystal Pilot Plant: Production & Applications” Dr. Behzad Ahvazi, Program Lead, Biomass Processing & Conversion - Bioresources at AI Bio’s sister organization, Alberta Innovates - Technology Futures, said that AITF is working with local pulp producer, Al-Pac, to advance the commercialization of this novel material. He said that CNC from the Alberta pilot plant has been shipped to a number of countries for experimentation in such materials as shoes, and in the aerospace industry. A little closer to home, CNC has potential commercial application in the oil and gas industry in fracking fluids and drilling oils. It also has potential applications in bio-medical products, as well as diversifying the product mix offered by the pulp and paper industry. The focus at the present time is to increase the conversion rate during the CNC production process, which at present is less than 50 per cent. Another presentation at the outreach event focused on AI Bio-funded research related to, “Remediation of Petroleum Hydrocarbons Using Phytotechnologies.” Dr. Barbara Zeeb, Canada Research Chair — Biotechnologies & Environment at the Royal Military College of Canada, said that they have developed technology and methodologies to use plants or trees to breakdown contaminants in soils to less toxic forms. These are plants that are native to the area, and with combined use of a biomaterial called biochar, the result can be a substantially bigger plant. “We’re actually ready to take this technology to the field,” she told the audience. All Impact Innovation presentations are available for review on the AI Bio website at http://bio.albertainnovates.ca/about/corpevents/impactinnovation2015/. And mark your calendars—Impact Innovation 2016 is Wednesday, May 11, 2016. Her audience represented the MPB scientific and government leaders manning the battlements in B.C., Alberta, Saskatchewan and Ontario, ever watchful for any sudden spread of the MPB beyond current established boundaries, given the devastation it has wrought in B.C.’s lodgepole pine forest and its ongoing infestation of Alberta’s commercial pine forest. Dr. Bleiker noted that cold weather alone is no guarantee of a potential beetle population collapse. That’s because research has shown that even if 90 per cent mortality occurs at temperatures of minus 35 degrees Celsius, the beetle can still maintain a stable population. Other factors working in the beetle’s favor, according to research conducted so far by the Canadian Forest Service, Foothills Research Institute, and researchers from other stakeholder groups, is that warmer temperatures and forest degradation from drought contribute to the beetle’s spread and that the beetle will feed on jackpine. This has particularly serious potential consequences for Canada’s entire commercial forest. 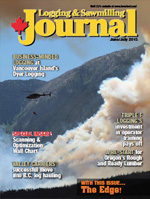 Given its mandate, the Canadian Wood Fibre Centre (CWFC) is concerned how this long term MPB presence will impact the value of the lodgepole pine timber supply now and going forward—and what industry and other stakeholders can do to capture as much value as possible from impacted forests, while implementing silvicultural practices that result in stand re-establishment as quickly as possible. Research conducted by Dr. Ellen Macdonald and others from the Department of Renewable Resources at the University of Alberta has shown that industry can’t depend on nature alone to regenerate the pine forest. Given this reality, the presentation given at the Forum by CWFC on innovative stand enhancement and regeneration systems to recover value, reduce risk and rehabilitate mountain pine beetle affected stands in the Alberta boreal plains ecozone was particularly timely. CWFC’s concern is that if a strategy to recover value and rehabilitate the many unmerchantable beetle affected sites isn’t implemented, this could lead to a significant delay in the re-establishment of these lands to a productive state, impacting wood supply in future. Risk reduction to wildfire and continued beetle production losses can also be addressed by adopting fibre recovery and advanced regeneration systems in affected stands. Derek Sidders, CWFC Regional Coordinator and Program Manager at the Northern Forestry Centre in Edmonton, along with Tim Keddy, CWFC Wood Fibre Development Specialist, presented a synopsis of CWFC’s project, being conducted in partnership with Canfor and the University of Alberta and supported by the Forest Resource Improvement Association of Alberta (FRIAA). The project has established a demonstration site and long-term research study to assess the impact of innovative partial harvest and regeneration systems on value recovery, risk reduction, and stand rehabilitation of beetle affected stands. It was launched in 2014 with the selective harvesting of 350 hectares of mixed beetle affected stands that had greater than 50 per cent lodgepole pine crown composition and greater than 15 metres in height. The stands were comprised of a mixture of green, red and grey lodgepole pine as well as white spruce and aspen. The harvest system that was used in the CWFC project selected active attack trees, green lodgepole pine greater than 20 centimeters DBH as well as incidental hardwoods and other softwood species, with the goal of finding a commercial use for this wood fibre, while creating space to selectively site prepare and plant to establish a new softwood crop. The goal was also to demonstrate that this method can be applied economically. “The objective was to transform a protection and rehabilitation prescription into multiple commercial values including sawlogs, OSB, pulp and pre-processed, densified and packaged woody biomass,” says Sidders, while opening up the stand to reduce fire hazard and establish a new commercial crop using advanced site preparation techniques including high speed mixing to reduce competition and enhance early establishment growth. 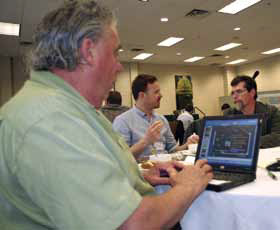 Derek Sidders (foreground), CWFC Regional Coordinator and Program Manager at the Northern Forestry Centre in Edmonton, was among the presenters at this year’s FRI Mountain Pine Beetle Information Exchange Forum in Edmonton. For more information on the methods and results of this CWFC study, contact Derek Sidders at (780) 435-7355 or Derek.Sidders@NRCan-RNCan.gc.ca or Tim Keddy at (780) 435-7212 or tkeddy@NRCan-RNCan.gc.ca.